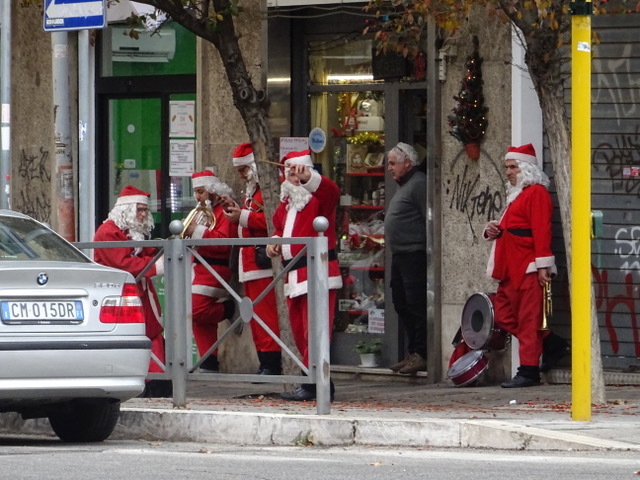 We get a wave from a friendly Santa this morning on our way to catch the bus to the catacombs. 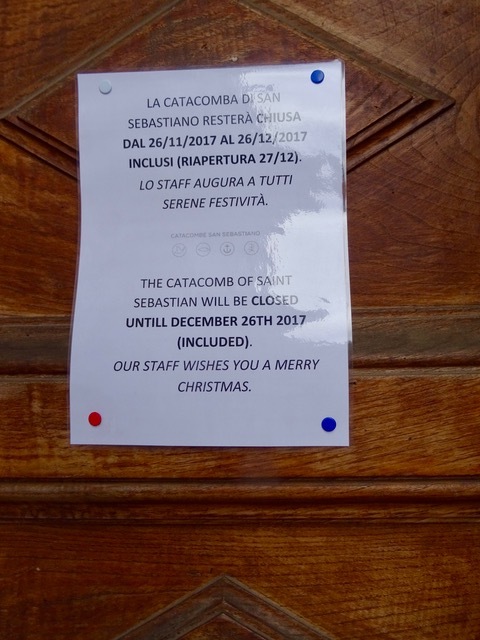 We arrive at the San Sebastiano Catacombs only to find this note tacked to the door. Too bad they didn’t bother to update the website. We visited the San Sebastiano Basilica, at least that was open. 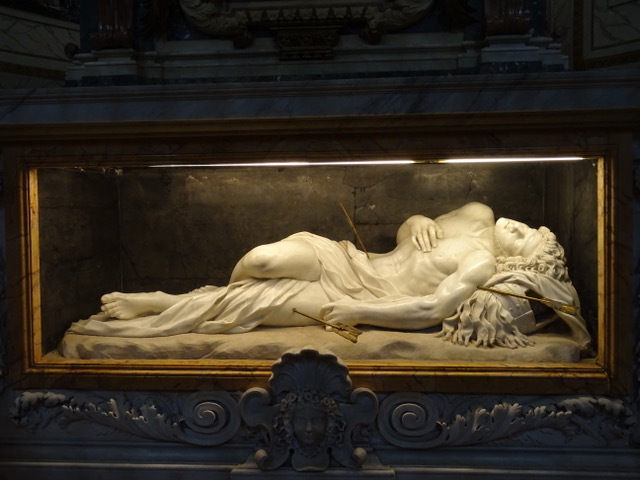 The remains of Saint Sebastian were at one time buried in the catacombs below the church. 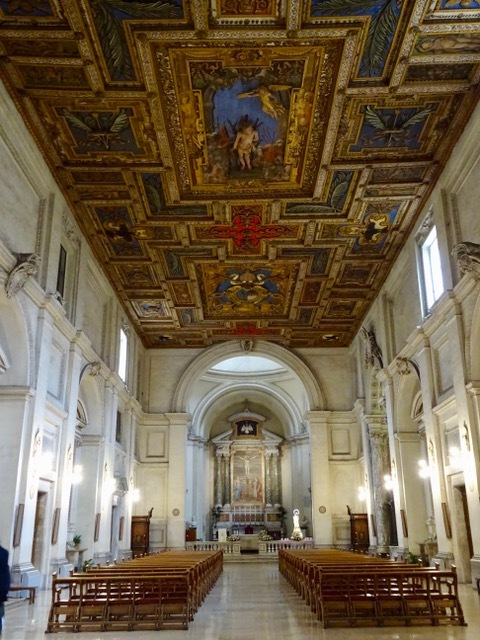 The basilica has a beautiful carved and painted wooden ceiling. 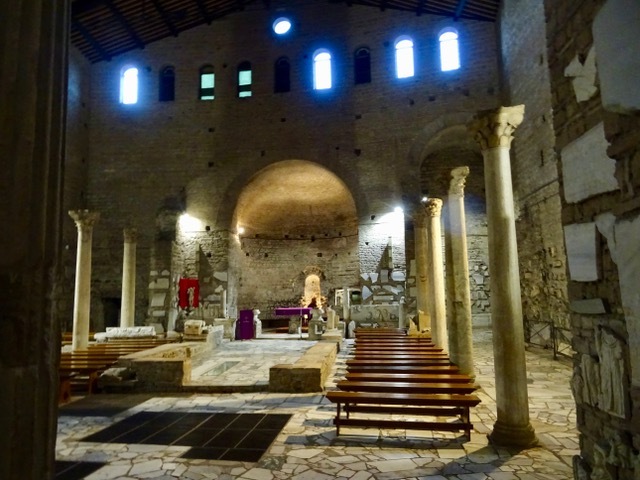 We shelter in the entrance of the church and have our lunch then head down the Appian Way to the Villa di Massenzio. 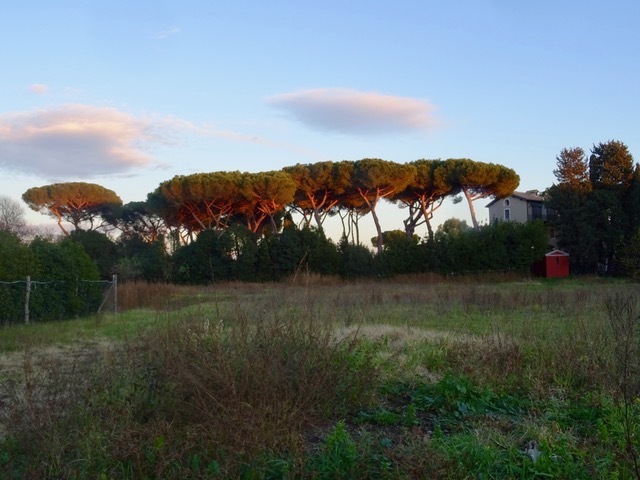 We ran out of time to visit here on our last visit to the Appian Way. This structure was the triumphal entrance gate to the Circus that was on this site. A circus is a Roman chariot racing stadium. 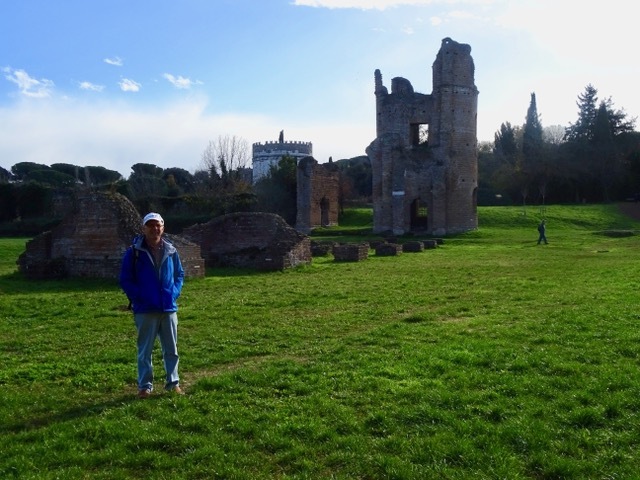 In the background is the Tomb of Cecilia Metella that we visited when we walked the Appian Way on Bob’s birthday . A view of the Circus. 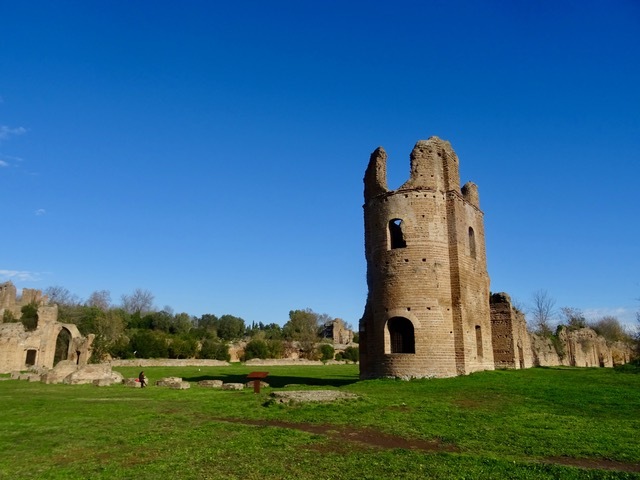 There is a tomb here built by Emperor Maxentius. I make like a statue in one of the niches. 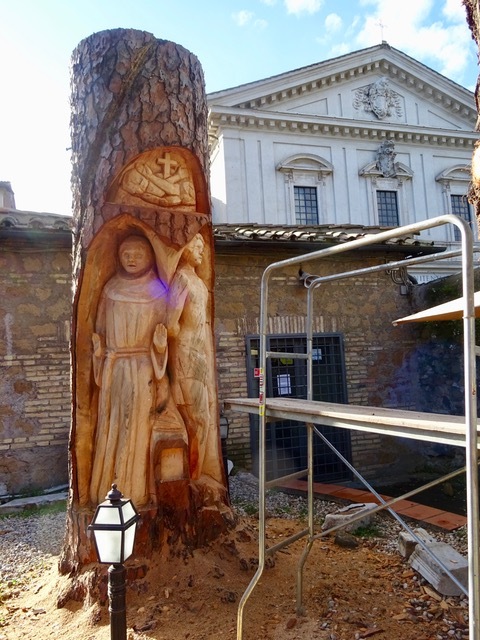 Walking back to the San Callisto Catacombs ,which were closed until 2:00, we see this tree being carved outside the San Sebastiano Basilica, which is in the background. 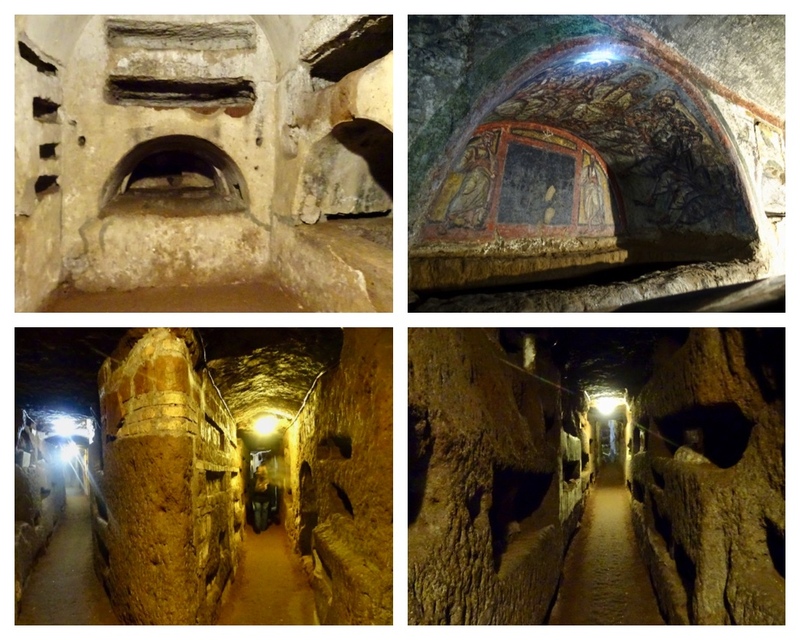 Our tour of the San Callisto catacombs is fascinating. Twelve Christians were killed by Roman soldiers in this small chapel known as the Crypt of the Popes as five early popes were buried here. 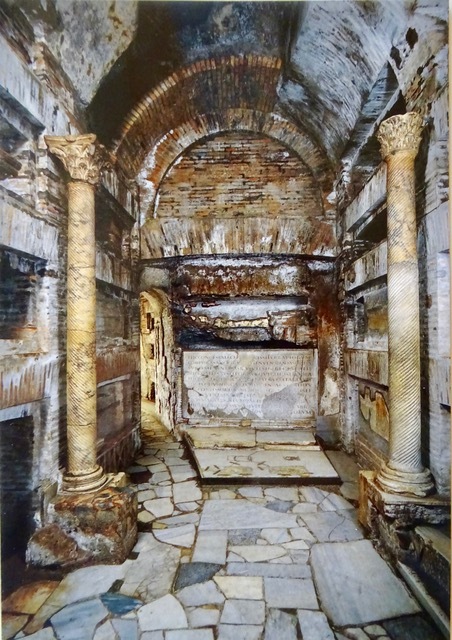 In the 20 km of tunnels spread over 20 acres, archaeologists have found the tombs of 16 early popes, dozens of martyrs and the remains of half a million Christians. No photos were allowed so these are photos of postcards I purchased in the gift shop. 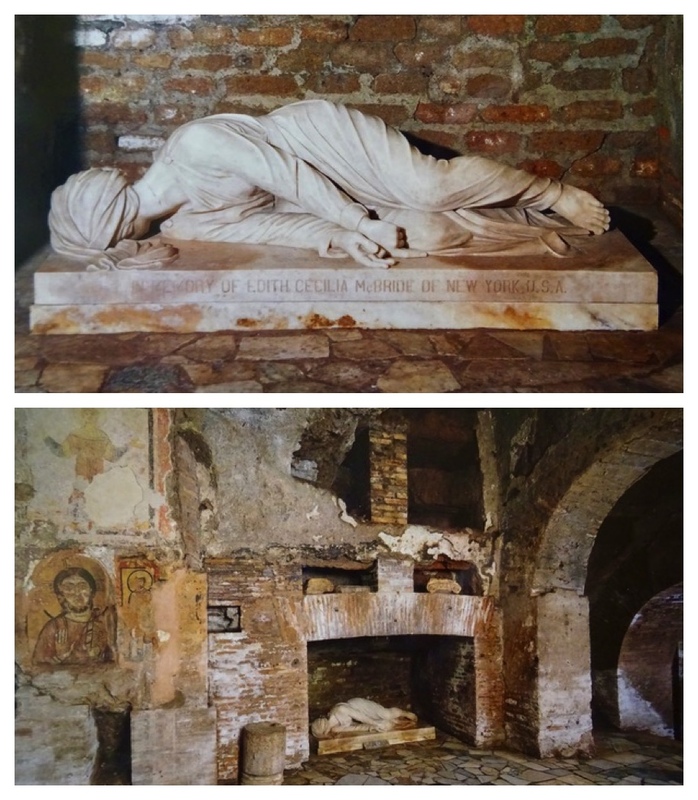 The Crypt of St. Cecilia is the tomb a young woman who was martyred in the 3rd c. because she would not renounce Christianity. When her body was exhumed in 1599, more than a thousand years after her death, it was apparently perfectly preserved, as depicted in this statue. 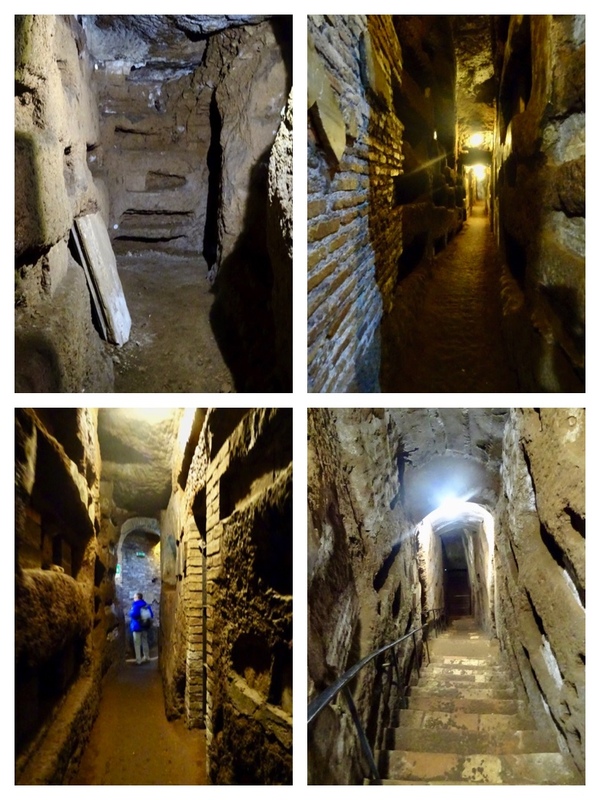 We decide to walk to the Domitilla Catacomb nearby. 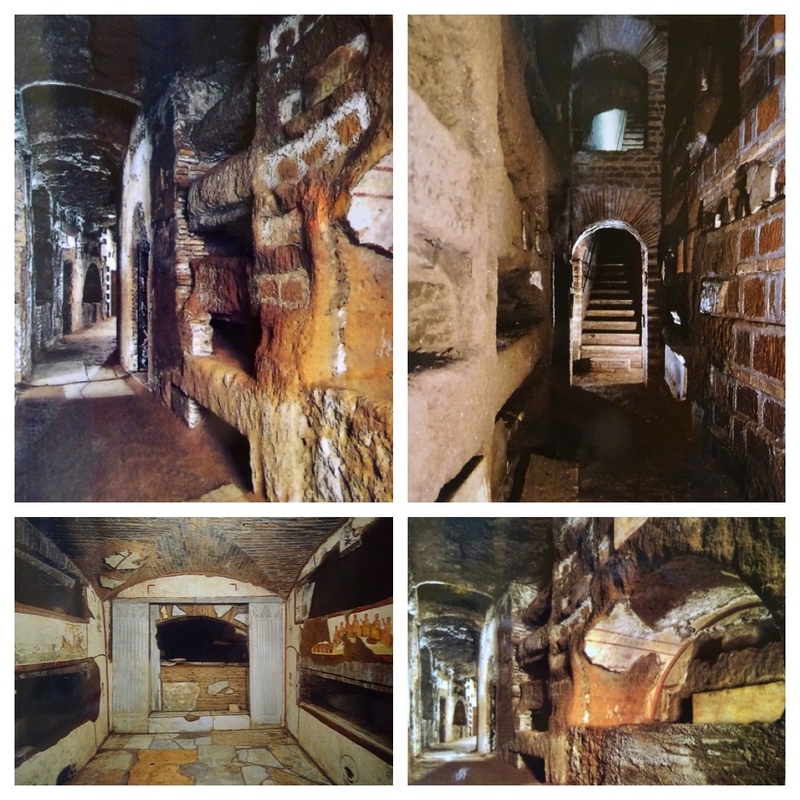 The catacombs of Domitilla are about 17 kilometers long and extending to a depth of around 30 meters. Our one hour tour only visits the little area highlighted in green at the top of the map. The tombs were carved into the tufa rock which was fairly soft. The oldest tombs are the ones higher up. When there was no more space left, the grave diggers lowered the floor level and put in more tombs. The different levels are connected with staiways. No photos are allowed but our guide, who happens to be the Director of the Catacombs, says it is OK if we take a few photos so I take advantage of his offer. Bodies were wrapped in shrouds, placed in the carved niches and then a cover was plastered over the opening of the niche. There are many very small niches as the infant mortality rate was very high. We see some bones in a few of the niches, but most of the bones where tourists visit have been moved because some of the tourists were talking home ‘souvenirs’. 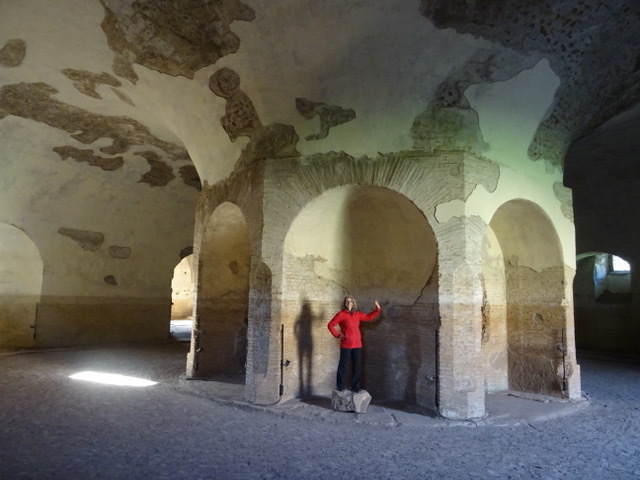 Our tour began and ended in this Basilica that was built at the end of the 4th century AD above the tomb of two martyrs, Nereus and Achilleus. 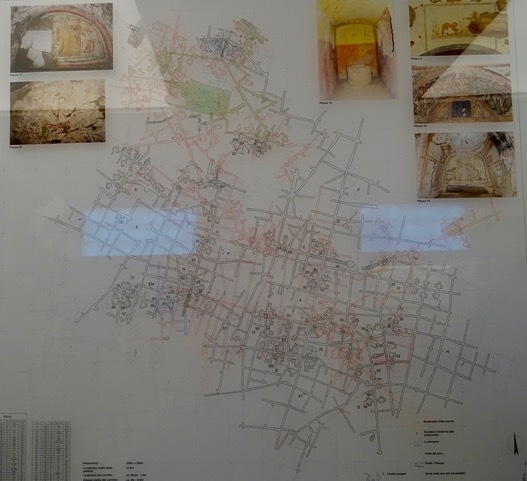 Most of this Basilica is underground. The top of a ventilation shaft is just visible in one of the fields above the catacombs. 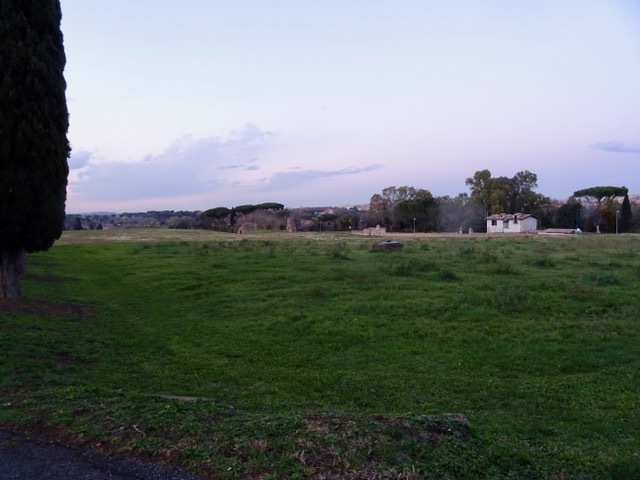 We continue along the Appian Way, and end up walking all the way home which took almost an hour. I loved the light on these trees.